We love our tortellini soup in my house. Once I found some room in my freezer, I have been purchasing the huge bag of tortellini from Costco to have on hand since it is so much more cost-effective than the smaller bags from the grocery store. This recipe is another great use for tortellini and is one my family gobbles up every time I make it. It is a touch more hands-on than some other recipes we've posted, but I wouldn't include it if it wasn't worth it. (And it still only takes about 30 minutes to make.) I love the combination of the chicken and bacon, the red pepper and broccoli, and the creamy sauce. Cook tortellini according to package directions. Meanwhile, in a large saucepan, cook and stir the chicken, bacon and seasoning over medium heat until chicken is no longer pink. Add onion and red pepper; cook and stir until tender. Add garlic; cook 1 minute longer. In a small bowl, combine the soup, milk, sour cream and cheese; stir into chicken mixture. Bring to a boil. Reduce heat; simmer, uncovered, for 5-7 minutes. Drain tortellini; add to chicken mixture. Stir in broccoli; heat through. My kids love meatballs. This quick and crowd-pleasing recipe has saved me many times. If I know I have to be late for an after-school appointment or meeting, I will prep this meal the night before. The next day, my husband or babysitter will just grab it from the fridge and bake for about 45 minutes. Everyone is happy. Leftovers are usually plentiful and feed us another night. Cook pasta according to directions; drain and rinse in cold water. Spread 1/2 cup pasta sauce in greased 13 x 9 baking pan. Tuck a meatball into each shell; arrange shells in pan. Top with remaining sauce and sprinkle with Italian seasonings to taste; add cheese. Cover; bake at 350 degrees Fahrenheit for 35 minutes. Mother's Day is seriously one of my favorite days of the year. It is a day that I allow myself to completely enjoy the great things about being a mom - and completely ignore the bad. I have no expectations of anyone doing anything for me; I make my day what I want it to be and anything else is the cherry on top. Here are some of my suggestions for having your own awesome Mother's Day - and make sure you enter our giveaway (details at the bottom of this post) to make it that much sweeter! 1. Make a decision to enjoy the day and not let things get to you (even if that means completely ignoring the bickering) - just for this one day. That may be easier said than done at times, but for this one day, it can happen. Just try to appreciate as much as you can, knowing how quickly things change. 2. If you have someone to make you breakfast in the morning - awesome. If you don't, do yourself the favor of throwing one of these make ahead breakfasts together the night before and you can enjoy the scents of a warm breakfast cooking in the morning without ever having to stand by a stove. 3. Go through a baby book or old pictures and realize all you have accomplished as a mom and all the milestones you have been there to witness - from first baths and hair cuts to potty training to getting your kids to eat with utensils (most of the time). Your kids will love walking down memory lane with you, too. 4. Decide on something you want to do and do it. Last year, I just wanted to be able to sit for a while and read a book and go to my favorite park to take a walk with my family. I never understood until I was a mom myself why my own mom always wanted to mow the lawn on Mother's Day...we had a large yard and it was a riding mower and it took a while and no one was allowed to bother her. Now, I get it. 5. Refuse to clean or do laundry. Just for this one day. 7. Whether a Starbucks, a massage, a good book, or a do-it-yourself pedicure, give yourself a little treat. Or better yet - win one! 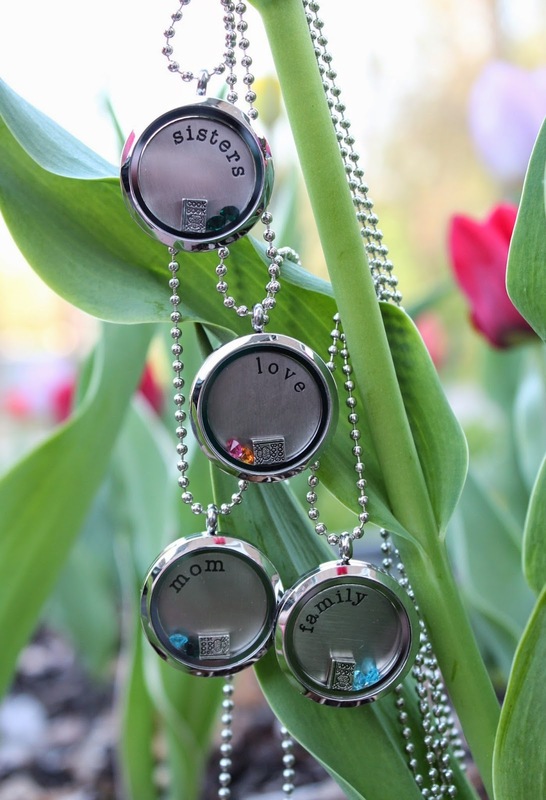 See below for details on how to win one of these beautiful memory lockets, customized with your preference of plate and birthstones (and a cookbook charm, too!) from Sweet Boo Berry Pie! How to enter: Go to our Facebook page or that of Sweet Boo Berry Pie and share any picture or link that strikes your fancy from either page. Your name will appear in our Facebook notifications and will be automatically entered into the drawing. Share as many of our pictures or links as you would like for more entries to the giveaway. One lucky winner will be selected at random using Random.com. This contest runs through May 15, 2014. The prize: The winner will receive one ball chain and one locket from those pictured above, as well as a face plate, cook book charm, and two birthstones. (More charms and birthstones are available for purchase.) The winner will be announced on our Facebook page and will be contacted through Facebook messenger. I received the April issue of Parents magazine mid-March and was excited to see an awesome selection of recipes to try. This one was top on my list as something that I knew my kids would enjoy and since I have been making a lot of pasta dishes lately, it helped me get a bit of variety into the rotation. I made a couple of slight changes to the recipe as it was written, and I was right - my kids devoured it. In a medium bowl, whisk together the eggs and 1 tsp of the soy sauce. Set aside. Heat canola oil in a large skillet over medium high. Add carrots and cook 2 minutes. Add chicken; cook and stir until chicken no longer pink - about 3 minutes. Mix in rice and remaining soy sauce; cook and stir for about 2-4 minutes or until heated through. Add green onions and then move chicken and rice mixture to one side of pan. Pour sesame oil into the other side of the pan. Allow to heat and then pour egg mixture in with the sesame oil. Allow to cook without stirring until beginning to set; then stir gently until completely set. Mix the eggs in with the rice and chicken.